This year the Guiness Book of Records will have to make room for one more record. I’m not talking about the world’s largest rubber-band ball or some guy who can shove 400 straws up his mouth. I’m talking about the world’s largest yerba mate circle, which took place in Missiones, Argentina on April 3rd 2016. According to a local newspaper, 15.000 materos gathered at the Costanera de Candelaria located in Missiones in order to attempt the world’s largest yerba mate circle. Thousands of families, neighbours and friends showed up at the event despite the heat and the rain forecast. The gathering began around 4 pm and featured an evening of concerts, food stands and an unique opportunity to be part of a historic yerba mate event. Among the materos were Alberto Blaza and Anabel Santini, representatives of the Yerba Mate Museum, who traveled 1700 Km from Buenos Aires in order to take part in this historic day. Blaza and Santini brought along a number of interesting mate-related artifacts and a sample of the “Ilumimate”. The Ilumimate is a mate made of a thermal material which glows in contact with hot water. 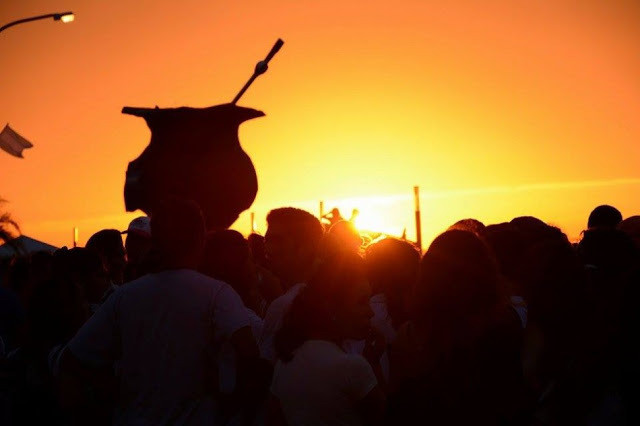 The Candelaria Circle was organised by the Ministry of Tourism of the province of Misiones, with the intent of turning the Candelaria into one of the world’s largest yerba mate centers. Due to the success of the event, the Ministry has already revealed their wish to turn the circle into a annual festival.